Wow. So this series just keeps getting more and more intense. And in such unexpected ways. I love it when an author has the ability (and the guts) to slip in a real shocker without compromising her characters or the story as a whole. In a series, that's particularly hard to do without making it seem like a gratuitous plot twist inserted merely to keep the series going. Patricia Briggs has a 7-book deal for her Mercy Thompson series and book three has shown that not only does she know exactly what she's doing, but that we can trust her. To keep her characters and her world consistent. To take them down the right paths and introduce them to the right people...or werewolves and vampires in this case. Mercy lives in a world where werewolves, vampires, and the fae exist side by side with humans. The first book, Moon Called, focuses on the werewolves. The second, Blood Bound, centers on the vampires, including Mercy's quirky Scooby Doo loving friend Stefan. 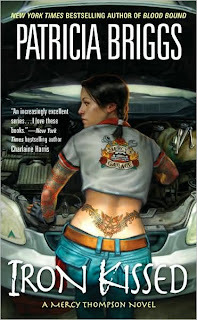 In this third installment, coyote shape shifter and VW mechanic Mercy Thompson is called in to help the fae solve a series of murders on the local fae reservation. Soon after, her friend Zee is arrested for the murder and, just like that, Mercy's in the thick of it, determined to clear Zee's name no matter what. Add to that the increasingly imperative choice she must make between the two werewolves in her life: Adam Hauptman (the Alpha of the local pack who's already claimed her as his mate) and Dr. Samuel Cornick (the wolf she fell in love with at 16). In what is becoming classic Briggs style, Iron Kissed combines an intriguing mystery with a streak of compelling romance, interspersed with glimpses of your worst nightmares. The combination is the height of entertainment. And what holds it all together is Mercy herself. The girl doesn't know the meaning of the words back down. I absolutely love these books. Sigh. I will try to console myself with the first Anna & Charles book in July. Angie, I loved Iron Kissed as well. The end through me off quite a bit, but I do think that Briggs did an excellent job with the book. Mercy is a great character, and I really want to see what happens next. I think she made a good choice based on solid reasoning and real emotion. It was good. I'm still not quite certain how I feel about the climax of the book. (I'm trying to avoid details here as I don't want to spoil it for anyone.) I'm not quite certain it was required. Do you know what I mean? Can we talk about this in another venue (email perhaps?) where I won't ruin it for others? I get this out of the way, stalk you blog, from Carrie's blog. I love to read great books and love to hear of new ones. I just started reading "Moon Called" and I love it, I am totally addicted! Thanks for the recommendation, I can't wait to read the rest of the series! I am thrilled you're loving Moon Called. I went nuts over it and the two sequels that are out are simply awesome. Let me know what you think. I loved the series, yep I read all three books. I can't wait for the next one.Thanks for the recommendation! I just finished the first one and loved it!!! It's always hard to pick up a book that has anything to do with vampires and werewolves....I have an all to active imagination when Jared is gone at night. But you were right.....this one was great and worth the risk. I have the next one on hold at the library....I went to three libraries trying to find a copy yesterday...no luck. Can't wait to read the next two. Liz, I'm so glad you gave them a shot, too! And glad they're not too creepy. Can't wait to hear what you think of Blood Bound. I adored it and it takes Mercy and the gang in some very interesting directions.